Introducing Dungeons & Dragons Attack Wing! WizKids Games sees the release of their much-anticipated D&D Attack Wing Starter Set . D&D Attack Wing is Dungeons & Dragons themed, and brings the heroes, villains, and monsters of the D&D universe to life in fierce miniatures combat. Along with the D&D Attack Wing Starter Set, seven expansions are also available at launch to help players dominate the skies in ferocious aerial duels! 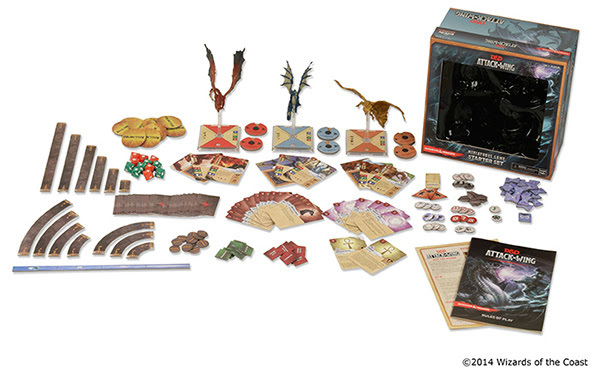 The D&D Attack Wing Starter Set , available at participating retailers and hobby shops for $49.99, includes three pre-painted dragons, maneuver dials, numerous upgrade cards and introductory scenarios to help you and your friends take flight and duel in fantastic acrobatic aerial battles. As part of today’s D&D Attack Wing launch, seven thrilling expansions including Green Dragon , Sun Elf Wizard , Frost Giant , Sun Elf Guard Troop , Hobgoblin , Dwarven Ballista and Wraith Expansion Packs, have been released, each priced between $14.99-$24.99. Take flight with Attack Wing: Dungeons & Dragons today!